In the immediate area where I live, I’ve started noticing that there are less and less bicycle racks than ever before. It seemed like every grocery store had them and each shopping center used to have a designated area for them. But not I’m venturing out more for casual rides and to find places to eat/drink, I’m having a harder time finding a good place to lock my bike. Take for example my trip to the grocery store, they used to have a HUGE bike rack. But now it’s gone. So I had to find some metal railing to lock my bike against. What’s interesting is, if I go do downtown Fullerton, the seems to be more of an acceptance to bicycles there. 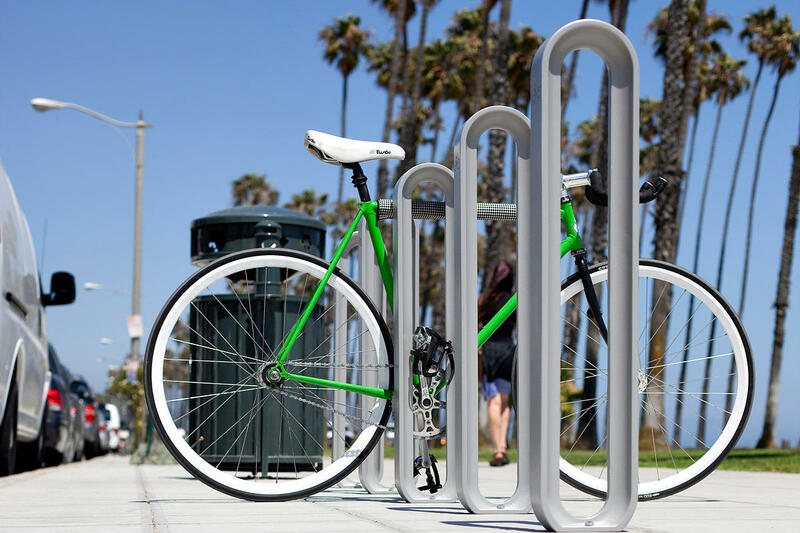 In fact there are actually quite a bit of 2-bike racks peppered around the area. I guess I just don’t get why in some areas, there are racks while others it’s absent. 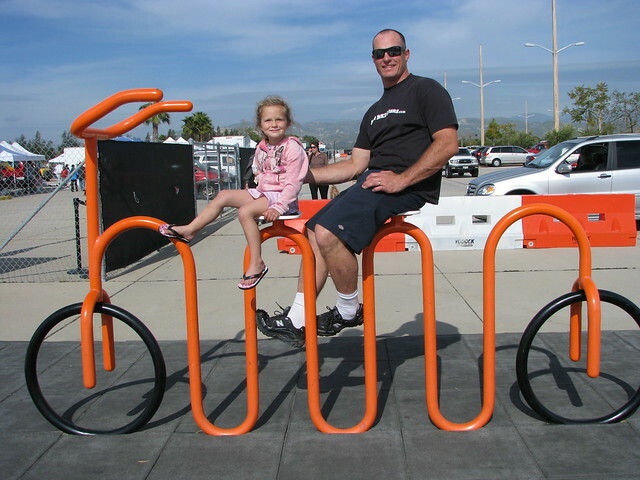 MtnBikeRiders.com Race Team member, “Animal” with his little girl, “Lil” Animal, poses with this interesting bike rack that they found in Irvine, Ca. Recently Banjo Brothers had sent me the Market Pannier to review and at the same time Wald sent me the 215 rack to review. MARKET PANNIER (deluxe grocery bag pannier) – It’s like a deluxe grocery pannier, only it’s so much more. This is a great bag for errands, commuting (drop your briefcase right inside), and visiting your favorite market. The easy-on and off mounting, long handles and a shoulder strap make it convenient to bring inside, and a large cinch-down flap keeps your stuff covered on the road. 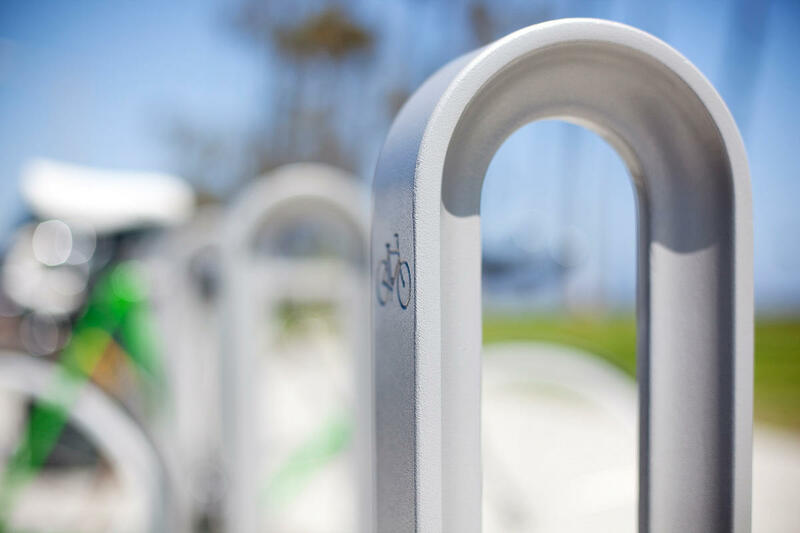 Wald bicycle racks offer a simple rear rack design for easy use. Lightweight yet sturdy construction with simple mounting points located at eyelets near the rear axle and the brake mount. The 215 works perfectly with our innovative 582 rear folding basket. Available in plated (215) and black powder coat (215BL) finish. Cargo capacity: my Crocs, gloves, rain jacket and other junk. The pannier can hold a standard paper bag. But with this pannier, you don’t need a paper bag since it has straps and handles that you can use as a grocery bag — what a great way to go Green.